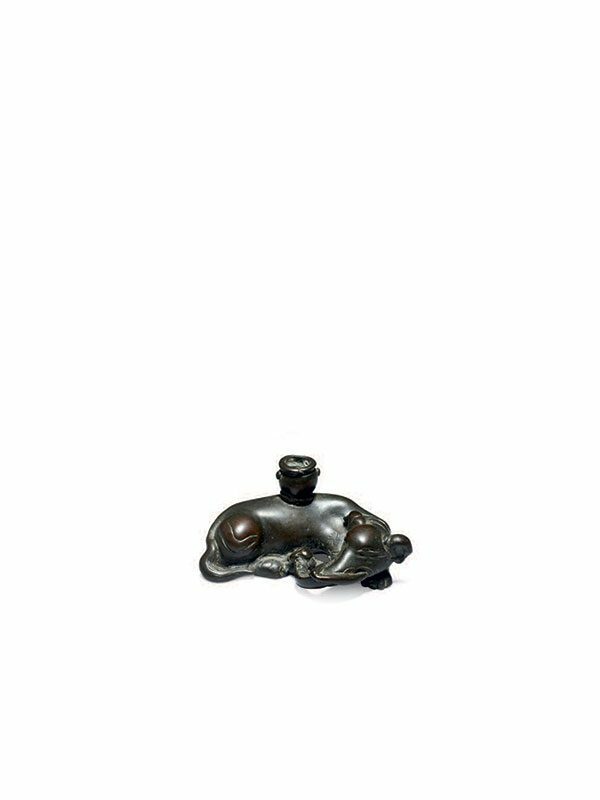 A bronze incense stick holder in the form of a recumbent elephant, carrying a spherical vase on its back. The animal turns its head toward the right side of its body. The pointed ears are folded down, its legs are tucked underneath its body and the paws are resting flat on the ground. The elongated eyes, curled trunk and sharp tusks are well defined. The bushy tail is curled around the hindquarters. The miniature vase on the elephant’s back is cast in detail with two protuberant handles and an upturned rim. The bronze is predominantly of dark brownish colour. . This small object has subtle Buddhist connotations alongside its function as an incense stick holder. The design of an elephant (xiang) carrying a vase (ping) on its back, is a pun for ‘peaceful time’—“when there is peace (tai ping), there are signs (ping).”  A pair of gilt bronze incense stick holders in the collection of Steven Hung & Lindy Chern, each in the form of a Buddhist lion and carrying a Xuande reign mark of the Ming dynasty, is comparable both in function and size.